Contemporary art has never shied away from incorporating the signs of the times into new work–as object, as medium, and as some combination of both. There has been a veritable explosion in the use of outmoded media in contemporary art: old books, old video games (and their consoles), cassette tapes, and perhaps mostly notably and numerously, the vinyl record. That’s the focus of The Record: Contemporary Art and Vinyl, currently on view at ICA/Boston. The show is both comprehensive and illuminating, especially for those who haven’t been keeping detailed notes on the use of vinyl in art. That is to say just about everyone who isn’t Trevor Schoonmaker, who put the show together for the Nasher Museum of Art at Duke University. There are 99 individual works by 41 different artists and the roster ranges from crowd pleasers–Jasper Johns, Ed Ruscha–to international artists who are likely less familiar to US audiences–Taiyo Kimura, Jeroen Diepenmaat. The overall experience of The Record is cohesive and the show encompasses a range of media and movements prevalent in the last half century. The viewer is presented with representational pieces (Dave Muller’s large-scale album cover paintings), video art (Christian Marclay’s close up needle-on-the-record meditations, among others), outsider art (Mingering Mike’s album covers for albums he never made), and broadly conceptual pieces (Dario Robleto’s slyly brilliant transformations of albums into usable household items). This amalgam of materials, shapes, and sizes also creates the only real problem with the show: the physical configuration. The ICA’s galleries are, for better or worse, vertically accommodating if not horizontally so, which results in quite a bit of walking in front of people and around the show itself. It seems as though the ICA underestimated the needed space and audience demand for The Record in comparison to the adjacent Catherine Opie exhibit which feels almost spare. Likewise, they’ve been pushing The Record via ads and related events while, anecdotally, I’ve seen very little advertising/press for the Opie exhibit. Setting aside space issues, this is one of those rare exhibits that reminds you that contemporary art is really about the cogent expression of engaging ideas. The record serves merely as a jumping off point for discussions on politics, socioeconomic issues, the meaning and understanding of time, and the idea of representation itself. Highlights include the miniature drawings and video work of Taiyo Kimura. His explorations of human interactions with record players produce compelling and often hilarious results. Laurie Anderson’s Viophonograph, a seminal work, is well displayed and the ICA provides context for the piece within the scope of her career as both a musician and visual artist. 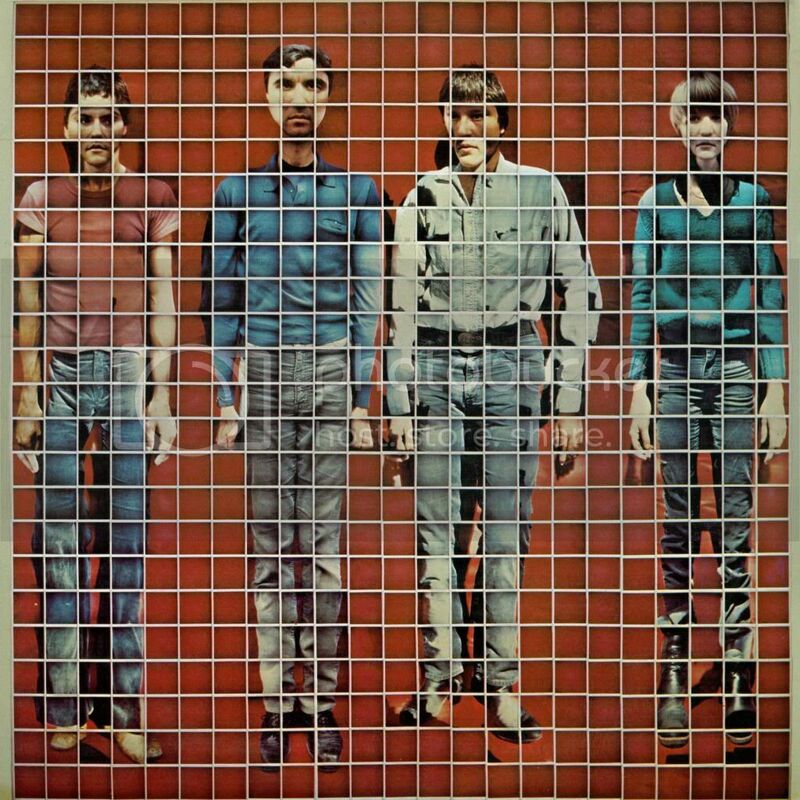 David Byrne’s Polaroid photomontage of Talking Heads, which became the cover art for More Songs About Buildings and Food, is also on display. The aforementioned work by Dario Robleto is definitely worth additional time and consideration. It’s quiet and poignant and, in an exhibit populated by video and sound-based work, can easily be overlooked. Perhaps, one day, our current media devices will be the new old technology, but as we move away from the importance of the container and focus solely on the content of that media, objects from the past become something we increasingly explore for their value as historical markers or as signifiers of an era rather than their practical use. The use of the record as an art object, which one could argue dates to 1958 (the year the RIAA started giving out gold record plaques), makes an immediate statement whose interpretation can be as varied as the musicians who made them. As The Record makes clear, in the right hands, these objects can communicate so much more than the sounds ground into their surface.